Costa Del Mar introduces new products every six months or so, it seems, so their Man o’ War lenses line up among the latest offerings from the company. From personal experience I can tell you that having a large face is not helpful when you’re trying to find sunglasses that fit. Thankfully not every sunglass maker takes the one-size-fits all approach to product design. Similar to the Frigate and Osprey sunglasses released last year, the Man o’ War line features a slightly larger frame size (it’s actually the largest of the three). The new sunglasses have removable side shields to block backlight and nose pads prevent slippage due to perspiration and are available with 400 or 580 glass or optical-grade CR-39 polarized lenses. Another thing we wanted to mention is Costa Del Mar’s new efforts on the conservation front (see “Costa Del Mar Does Conservation in Style“). No, it’s not going to make eyewear for fly fishers any better, but it will help preserve the stuff we like to look at. Manning their first booth at an FFR show, Kaenon showed they are serious about taking the lessons they learned from being a top inventor of lens technology for professional sailing and delivering it to fly fishers. After trying Kaenon sunglasses for the first time last year, we were surprised by the quality of the lenses, but we shouldn’t have been: Kaenon’s patented SR-91 lenses were given an optical acuity and clarity rating of “40” by the independent COLTS Laboratories — the highest possible score in the stringent ANSI Z.87.1 testing system. For fly fishers, the styles we liked the best were the Rhino and Beacon frames. 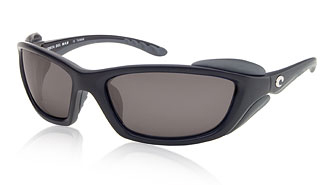 Fortunately, Kaenon makes lenses in multiple tint levels, so you can choose between a number 12 lens (the darkest, and suitable for flats fishing), or a number 28 (suitable for less than full sun), or even lighter lenses for special situations. Back in the day when we thought it was pretty cool to drive 65 miles per hour to get to our favorite tarpon spot before anyone else, nobody was thinking much of polarized eyewear whose chief design feature was eye protection. A few folks thought ski goggles perfect for an early morning rocket ride, but they weren’t polarized and they looked dumb. Many guides went without eye protection because they couldn’t see in the dark. Even dumber. Panoptx would have sold a bunch of their Windless Eyewear products to us, and we would have been endlessly thankful. The biggest problem with full-enclosure eyewear has always been that it has been impossible to adjust the amount of air flow reaching the eyes (this is as true of side shields and wide, wrap-around frames as it is of foam linings). Panoptx has solved this problem with a removable vented seal in their Velocity series. The lenses we tried on at the show were also photochromatic — just the ticket for pre-dawn patrolling. Smith Optics is introducing a very cool new Interlock interchangeable lens system in select models this year. With the Interlock system, you twist the sunglass earpieces at the temples, opening the frame by 2.5mm and enabling easy removal and insertion of lenses. It’s a great option for those who deal with different levels of light and for anglers who fish in different environments and want, for example, amber lenses for flats fishing but gray lenses when fly fishing for bonito. The new sunglasses from Orvis seem to be mostly updates of last year’s introductions, with new styles available in the Tri-Spectrum series and new inexpensive Superlight models in a variety of styles. The Superlight SA Wraps, Superlight Wraps and Ultimate Superlights feature thermal-formed polycarbonate polarized lenses and all retail for $49.